Anthias swarm over soft corals on a reef in Eastern Fields. Papua New Guinea. Anthis soft coral reef scene in Fiji. A large pod of Hawaiian spinner dolphins (Stenella longirostris) over rocky bottom off Oahu, Hawaii. Brightly colored sponges, starfish and anthias reef scene in Raja Ampat, Indonesia. Wild soft coral reef scene. Indonesia. Jacks hunting on blackstreak fusiliers (P. tile). Indonesia. Colorful anthias (Luzonichthys waitei) swarm over a healthy coral reef in Papua New Guinea. We saw huge schools of this species congregating when the currents picked up. The fish would swim up current close to the reef in multiple "streams" that looked like "super highways", then rise up several feet, disperse in the water column, feed with current for 10-30 feet and then drop down into the flow of "traffic" to repeat the cycle over again. An incredible sight! Mushroom soft corals (Sarcophyton sp.) and anthias close-focus wide-angle reef scene. Fiji. Silverside from massive school above gorgonians in Raja Ampat, Indonesia. Yellow-face angelfish (Pomacanthus xanthometopon) on a reef in Indonesia. Anthias swarm around gorgonian on a reef in Eastern Fields, Papua New Guinea. Soft corals, anthias and fusiliers. Indonesia. Indo-pacific sergeant and anthias reef scene. Fiji. A bignose unicornfish (Naso vlamingii) poses infront of a school of blackstreak fusiliers (P. tile) in blue water. Indonesia. Diver descends down onto wreck in the Bahamas. Green turf algae and soft coral reef scene. Fiji. Old tires create a thriving artificial reef off Bali, Indonesia. Schooling milletseed butterflyfish (Chaetodon miliaris) on a reef off Oahu, Hawaii. Convict blennies (Pholidichthys leucotaenia) school over a colorful reef in Raja Ampat, Indonesia. Anthias-Soft coral-Gorgonian reef scene. Papua New Guinea. A potato grouper (Epinephelus tukula) over gorgonians swims up into the light. Papua New Guinea. Sunrays rain down above clownfish in anemone. Papua New Guinea. Diver next to wreck in the Bahamas. A hawksbill sea turtle (Eretmochelys imbricata) swims past colorful soft corals. Indonesia. Bluetail unicornfish (N. caeruleacauda) schooling on a deep reef in Indonesia. Blacktail barracuda (Sphyraena qenie) school on a reef in the Solomon Islands. In Florida artificial reefs made from old tires often fail to develop life and even damage nearby reefs during storms. But in the highly productive waters off Bali, even old tires develop into thriving ecosystems. Indonesia. Colorful anthias schooling around sea whips. Papua New Guinea. Convict blennies (Pholidichthys leucotaenia) racing over a colorful reef in PNG. Papua New Guinea. Coral grouper (Epinephelus corallicola), schooling glass fish reef scene. Indonesia. Bluestripe and goldline snappers schooling below boat. Indonesia. Over-under photo of jacks and sharks on a sandbar with Moorea's mountains in the background. French Polynesia. Sponge, soft coral silverside, angelfish reef scene. Indonesia. Magenta slender anthias (Luzonichthys waitei) school over soft corals in Eastern fields. Papua New Guinea. Magenta slender anthias (Luzonichthys waitei) swarm above gorgonian. Indonesia. Barramundi cod (Cromileptes altivelis) and silversides in Raja Ampat, Indonesia. A giant star coral. Fiji. Corsair wreck off Oahu. Hawaii. Hawaiian spinner dolphins (Stenella longirostris) cruise on the glassy ocean surface infront of Diamond Head, Oahu on a picture perfect day. Colorful soft coral reef scene. Indonesia. French angelfish (Pomacanthus paru) on a Bahamian reef. Colorful wrasses and butterflyfish gobble up Pacific sergeant eggs. Indonesia. Spotted eagle ray (Aetobatus narinari) swim above rocks in the shallows off the Big Island at dawn. Hawaii. Bluestreak fusilier (Pterocaesio tile) reef scene. Indonesia. Indo-pacific sergeant and anthias reef scene at sunset. Fiji. Sea whip gorgonian reef scene. Papua New Guinea. Massive school of narrowstripe fusiliers (Pterocaesio tessellata) on a reef in Raja Ampat, Indonesia. Indonesia. Pinnate spadefish (Platax pinnatus) schooling on a reef in Raja Ampat, Indonesia. Sponge soft coral silverside reef scene in Raja Ampat, Indonesia. False clownfish (Amphiprion oceallaris) anenome scene. Indonesia. A squirrelfish and surgeonfish hover above a bommy in the Bahamas. A school of bigeye trevally (C. sexfasciatus) races along sea cliffs under stormy seas off Socorro Island. Shallow water soft coral reef scene. Indonesia. Massive schol of silversides above gorgonians in Raja Ampat, Indonesia. Anthias swarm over a colorful soft coral reef. Papua New Guinea. Anthias swarming above sea whips. Indonesia. Colorful soft corals and fish on a reef in Fiji. False clown anemonefish (Amphiprion oceallaris) in a closed anemone. Papua New Guinea. Bluetail unicornfish (Naso caeruleacauda) schooling on a reef. Papua New Guinea. Sunrays break through a tree above gorgonians, sponges and anthias. Papua New Guinea. Gorgonian, dendronephthya, sponge fish reef scene. Indonesia. Hard coral reef reflecting on the surface. Tonga. Ribbon sweetlips (Plectorhinchus polytaenia) schooling on a deep reef in Raja Ampat, Indonesia. Magenta slender anthias (Luzonichthys waitei) school over gorgonian in Eastern Fields. Papua New Guinea. A huge pod of hawaiian spinner dolphins (Stenella longirostris) swims over sand in clear waters off Oahu. Hawaii. A small school of oriental sweetlips (Plectorhinchus vittatus) on a bommie. Indonesia. Chromis sp. schooling next to gorgonian. Indonesia. Bluetail unicornfish (N. caeruleacauda) schooling together with yellowmask surgeonfish (A. mata) on a reef in Indonesia. Niger triggerfish (Odonus niger) schooling on a reef in Raja Ampat, Indonesia. Indonesia. Six-banded angelfish, clown triggerfish, moorish idols feed among softcorals in Raja Ampat, Indonesia. Sunrays break through trees inside snell's window. Papua New Guinea. Blue starfish and soft coral reef scene. Indonesia. Bigeye scad (Selar crumenophthalmus) school under fishing boats. Indonesia. A giant frogfish (Antennarius commerson) pair blend in with colorful sponges on a deep reef. Indonesia. White sand, turqoise water and a rippled surface. Tranquility in the Bahamas. Soft corals and anthias close-focus wide-angle. Fiji. Orange lyretail anthias and hard corals in Fiji. Solomon Islands. A queen angelfish (Holacanthus ciliaris) swims past a sea fan. Bahamas. 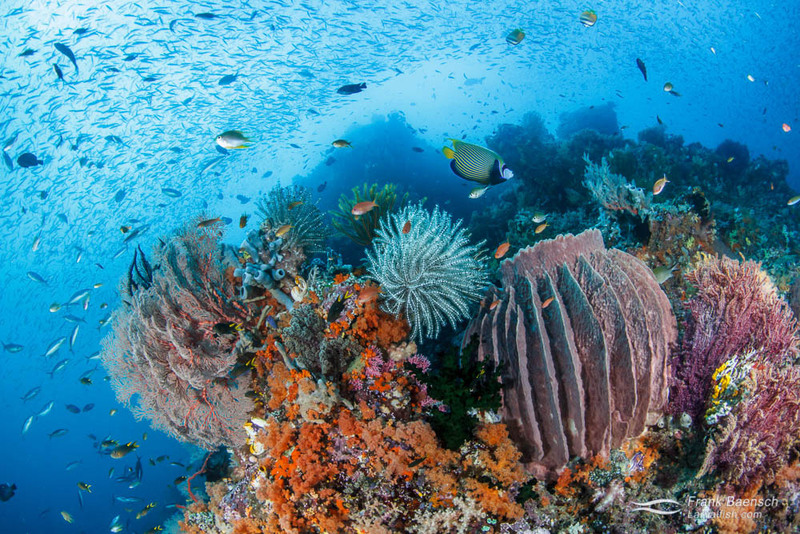 Wild reef scene with fish and soft corals in Indonesia. Goatfishes schooling above bolders at sunrise off the Big Islands of Hawaii. Colorful butterfly fish gobble up Pacific sergeant eggs. Indonesia. Colorful anthias swarm over a healthy coral reef in Papua New Guinea. Anthias soft coral reef scene in Fiji. Reef scene with fusiliers and corals. Fiji. Don’t mess with my reef! A coral grouper (Cephalopholis miniata) in his soft coral garden. Indonesia. Coral grouper (C. miniata) about to hide in a mushroom leather coral. Indonesia. Banded sweetlips (Plectorhinchus lineatus) school under a colorful bommie in Raja Ampat, Indonesia. French grunts (Haemulon flavolineatum) seek shelter under elkcorn coral at dusk. Bahamas. Three pink skunk clownfish (Amphiprion perideraion) line up on a colorful reef in Indonesia. Ribbon sweetlips (Plectorhinchus polytaenia) school on gorgonian among juvenile convict blennies (Pholidichthys leucotaenia) in Raja Ampat, Indonesia. Coral grouper (Cephalopholis miniata), fusilier, silverside, sponge, crinoid, soft coral reef scene. Indonesia. A plane wreck in shallow waters of Exuma, Bahamas. Oriental sweetlips (Plectorhinchus vittatus) under a ledge. Indonesia. Soft corals and anthias reef scene. Fiji. Fusiliers schooling around gorgonians. Indonesia. Sponge soft coral silverside damselfish reef scene. Indonesia. Sea whip reef scene. Indonesia. Coral grouper (Cephalopholis miniata) soft coral reef scene. Indonesia. The healthy coral reef in Fakarava South Pass (Tetamanu Pass), French Polynesia.